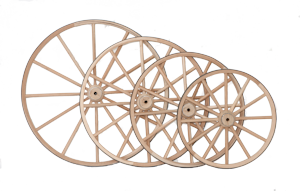 At Custom Wagons we carry a complete selection of Wagon Wheels, Wood Wagon Wheels, Steel Wagon Wheels, Cannon Wheels, and Wagon Wheel Chandeliers, Yesterdays Handmade Wagon Wheels, Made in the USA. For 50 years Wagon Wheels and Wagons is what we do. Wagon Wheels, Wood Wagon Wheels, Cannon Wheels, Custom Wagon Wheels and Horse Drawn Wagon Wheels. Wagon Wheel Chandeliers, Yesterdays Handmade Wagon Wheels, Handmade in the USA Today. For 50 years Wagon Wheels and Wagons is what we do. That is why we sell more Wagon Wheels and Wagons than anyone else. Click To View Pictures and Videos, THANK YOU to the citizens of Springfield, IL for their kindness and hospitality and especially to the Staab Family without whom this project would never have existed. Custom Wagons was one of the build teams of Combat Veterans for the reconstruction of the Abraham Lincoln Hearse and the celebration of the 150th Anniversary of his burial in Springfield?s Oak Ridge Cemetery. The problem was that the original hearse had been retired after it was used for the Abraham Lincoln funeral. The hearse itself was stored on the second floor of Lynch & Arnot livery company, where it was destroyed in a massive Feb. 9, 1887, fire that killed three people and about 200 horses. 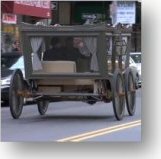 There was only one picture that existed of the original hearse, so all the information about the original hearse needed for the reconstruction of the new hearse, had to be extrapolated from that one existing picture. CLICK To View Commercial , When Dunkin' Donuts wanted their new Dunkin' Donuts Pumpkin Muffins TV Commercial, with a play on Pumpkin Chunkin and a catapult would be a good idea, which meant Custom Wagons got a call to make the Wheels for the catapult. The two companies that were building the monster catapult, Steelhead Studios in Holyoke, MA and The Specialists LTD, a weapons Prop Company in NY, could design and make the catapult; their problem was those pesky heavy Wood Cannon Wheels. As you can see, the catapult's wood chassis stood eleven feet high and held a twenty two foot long steel boom. 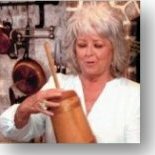 Paula Deen Receives Our Small Wood Butter Churn As A Gift at a dinner party. We received an e-mail from a customer who stated the they would be attending a dinner at the home of Ms. Deen and would like to take one of our small Wood Butter Churns as a gift. We built the small Wood Butter Churns for the customer and the customer took the small Wood Butter Churns to Ms. Deen on the night of the dinner at her home. We are not trying to put words in Ms. Deen's mouth, however, I think her face says it all. All I can say is that is one lucky Butter Churns, day after day, being able to be in Paula Deen's kitchen, seeing and smelling all that good Paula Deen food. This carriage runs on four (4) 12 volt batteries. Custom Wagons built the unique Wagon Wheels for this one of a kind art vehicle which artist Seth Kinmont exhibited in New York at Project No. 8 and was later on display at the Henry Art Gallery in Washington. Artist Seth Kinmont's Electric Wood Automobile, view Videos and Pictures of this Electric Wood Vehicle on our site, Kinmont introduces the automobile to American, by using the allure and history of independence and travel.